On 23 February, the administration of the Belarusian State University expelled the youth activist Yury Lukashevich. The former student claims that the reason behind his expulsion lies in his political activism and board membership in an oppositional party. While the activity of independent youth organisations faces restrictions, the state-funded Belarusian Republican Youth Union (BRSM) receives an enormous amount of government money. BRSM is the largest youth organisation in Belarus and has a virtual monopoly on youth activism. Nevertheless, despite a challenging environment and political pressure, independent youth organisations continue to promote democratic values and organise educational programmes and charity projects. 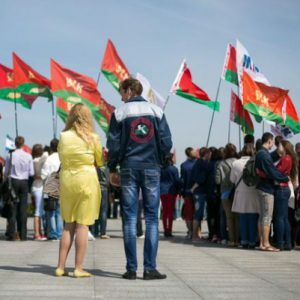 Youth movements in independent Belarus began taking shape in the 1990s during the final days of the USSR. Some organisations started as grassroots initiatives, while others – such as Hramadzianski Forum – became parts of political parties. Many initiatives grew out of interest clubs, such as the historical-cultural club Pahodnia in Hrodna. In 1990, the amount of non-profit organisations in Belarus reached 3,500. A significant part of them dealt with youth issues. Perhaps the apogee of the youth movement in Belarus in the 1990s was the Belarusian National Youth Council, or RADA. RADA emerged in 1992 as an umbrella organisation uniting youth activists from various groups. RADA became the most powerful and popular association, and it was even able to influence policy and establish a partnership with the European Youth Forum. The Union of Belarusian Youth, also founded in 1992, had its roots in the communist system and enjoyed support from the government since its inception. Already in 1996, Lukashenka openly supported the Union and suggested creating a new umbrella organisation. The Belarusian Republican Youth Union emerged in 2002 as a youth association loyal to and controlled by the government. Several years later, the authorities decided to increase control over youth activism. In 2003, Lukashenka called RADA ‘some tattered umbrella [organisation] of RADA itself’. In 2006 the authorities introduced a new amendment to the law on NGOs and required re-registration. Thus, RADA was unable to re-register due its clashes with the authorities and its extended links with foreign organisations. Since 2006, when RADA was closed, it has continued to function as an unregistered entity. Youth activism in Belarus remains clearly divided between organisations supported by the government and independent ones. As such, BRSM and BRPO (a pioneer organisation) receive benefits and discounts ranging from ‘help’ entering university to discounts in supermarkets.TUT.by reports on many discounts in the services sphere, such as in tyre fitting, tanning booths, billiard halls, and gyms. At the same time, many independent organisations, such as RADA, have restricted access to youth because of their status as unregistered organisations. BRSM has several major projects and campaigns. One of its largest projects is ‘100 Ideas for Belarus’. Financed by the state and BRSM itself, the project offers funding to young people with the best projects. However, many of the meetings, festivals, and contests in the framework of ‘100 Ideas for Belarus’ have become a propaganda tool for BRSM to demonstrate its immensity. Another annual campaign, ‘United for safety and public order’, openly highlights the cooperation between BRSM and the police. BRSM and the Ministry of Internal Affairs invite youth activists to patrol public places around the entire country. According to BRSM, the main aim of the campaign is prevention of youth crime. The campaign, however, often turns into a demonstration of support for the government. The independent union RADA organises many activities related to education and engagement. One of its most famous educational programmes, ‘Academy the First’, aims at the informal education of Belarusian youth and development of leadership skills. ‘Academy the First’ is based on democratic values and promotes informal methods of education. The project receives funds through Scandinavian youth organisations. Independent activists also conduct advocacy campaigns for solving pressing issues. Thus, in 2015, Belarusian students protested against re-examination fees. Later, in 2015, youth activists organised a campaign against curfews in dorms which forbid students from entering the facilities between 12 am and 6 am. After gathering support, activists sent a petition to the Ministry of Education. In May 2015, students of the Belarusian State University and the Belarusian State Economic University were able to get rid of the curfew. Nevertheless, officials have not considered any demands for change in the regions. Sociologists have trouble assessing the real number of youth organisations. The Ministry of Justice reports 800 registered organisations related to youth activism. However, a recent study of the Office for European Expertise and Communications, called 'Potential of Interaction of Youth Public Organisations and Initiatives to address Common Objectives' showed that only 295 of them function actively. Around 10% of youth organisations, including RADA, are unregistered, and the status of another 10% remains unclear. Youth activism appears to be centred in Minsk, while the regions lag behind. According to the above-mentioned study, 62% of youth organisations are currently operating in Minsk. In Hrodna, for example, the number of youth associations decreased from 27 in the 1990s to three in 2017. Moreover, BRSM pressures many young people into becoming members, thus formally increasing the amount of members in the regions. BRSM is still the only youth organisation which receives funding from the state. This funding has been increasing since 2005, growing enormously in 2009, reports udf.by. Blogger Viktar Malisheuski has estimated that in order to fund BRSM, the state would need to collect taxes from 17,226 social parasites. Independent youth organisations are more engaged, becoming increasingly active in various fields. The activity of many associations has shifted to the internet. For instance, the Young Christian Democrats are currently calling on the media to boycott McDonald's in Minsk over social media. The youth wing of the Belarusian National Front (BNF) are collecting petitions to benefit former workers of Charnobyl. Over the past month, youth have actively participated in protests against the social parasite law. Students, anarchists, and ecologists have become among the most visible groups at demonstrations. Aliena Kisiel, a student from Mahiliou, was expelled from university for participation in the protests. Belarusian State University kicked out another student, the youth leader of BNF Yury Lukashevich, for his activity protecting the Kurapaty site. Youth activism in Belarus remains in a difficult situation. Independent youth organisations suffer from monopolisation of the sector by BRSM and absence of dialogue with the government. At the same time, activities of independent organisations and cooperation with international partners allow youth associations to maintain their activities. Reform of youth policy should begin with reinforcement of activism as a value and simplification of the legal environment. Lukashenka finally signs laws on implementaiton of the Eurasian Customs Code. After a presidential meeting in Saint Petersburg, Russia approves additional credit for Belarus. Foreign visitors of the 2019 Eurogames are to enjoy more beneficial visa-free regime. Legislation on business liberalisation is open for public consultation and recommendations. Belarusian space scientists prepare to launch two satellites by 2020. Lukashenka signes a set of agreements on strengthening the integration of the Eurasian Economic Union. On 11 April 2016, Belarusian President Alexander Lukashenka signed a package of agreements on integration with the Eurasian Economic Union, including the Customs Code of the Union, reports Belarus Segodnia. All other Union members signed the Customs Code at the Summit in December 2016 but Lukashenka refused to participate on the grounds that Russia had gravely violated existing agreements within the Union. The agreements will secure the strategic engagement and political stances of Belarus within the Union regarding further integration with the global economy, as well as enhancing economic cooperation and free market negotiations with developing foreign economies. Additionally, they will advance custom-free regulations, coordinate the financial and energy markets among the members of the Union, and coordinate transport, information, and trade policies. Belarus will extend the visa-free term for foreign visitors for the 2019 Eurogames in Minsk. Zviazda reports that the government is considering extending the length of visa-free stays for visitors of the 2019 Eurogames, so that they will have enough time to discover nearby places, which in turn will contribute to the development of Belarusian cultural tourism. Voters decided to hold the 2019 Eurogames in Belarus at the 45th session of the General Assembly of the European Olympic Committee in Minsk in October 2016. Legislative and regulatory acts on business liberalisation open to public consultation. The government presented a set of regulations meant to ease the business environment significantly for a month of public consultation, writes Belarus Segodnia. The altered legislative framework facilitates setting up businesses, minimising requirements and allowing hopeful entrepreneurs to simply notify the government when they open a business. It will be the responsibility of business owners to comply with the new framework. It also repeals scheduled inspections, ensuring that only informal and well-grounded inspections will be held, and introduces a tax advisory for business. The regulations also enact a moratorium on introducing new taxes for business. Rosselkhoznadzor gradually lifts ban on Belarusian food exports. Experts at Rosselkhoznadzor, the Russian supervisory agency responsible for overseeing food production, checked 18 Belarusian food processing plants and lifted temporary restrictions on beef, meat products, and finished meat products from two enterprises. Leanid Zajac, Belarusian Minister of Agriculture and Food warned farmers, food processing companies, and officials in the Ministry of Agriculture to pay maximum attention to the implementation of technologies and production regulations. The Russian supervisory authority remains extremely meticulous about Belarusian exports and sometimes goes beyond the bounds of common sense. 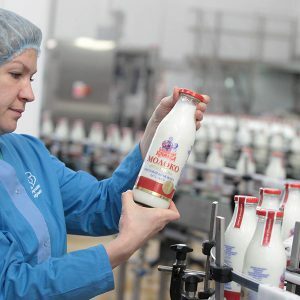 The Russian market remains a priority: in 2016 Belarus exported food products worth $3.7b to Russia, or 14.8% of the Russian Federation's total import. The inspection also targets the re-export of agricultural products banned by Russian counter-sanctions against Western countries. The head of Rosselkhoznadzor, Sergei Dankvert, accuses Belarus of re-exporting products from the sanction list and deliberately distorting statistics. Russia will give Belarus an additional $1b in credit. On 9 April 2017, Belarusian Vice Prime Minister Uladzimir Siamaška announced that following the meeting between the Belarusian and Russian presidents in Saint-Petersburg, the two parties have reached an accord to grant Belarus about $1b in credit through the Eurasian Fund for Stabilisation and Development. This comes in addition to an already-facilitated loan from Russia worth $1.4b allocated to Belarus through the Fund between 2016 and 2017. Belarus received both loans on favourable terms, reports Belarus Segodnia. Belarus fails to tackle forced labour of Belarusian construction workers in Russia. According to Oleg Melnikov, head of the movement Alternativa, which provides assistance to victims of slavery and forced labour, his organisation has rescued and assisted in the release of about 400 Belarusian citizens subjected to slavery in the Russian Federation over the course of almost six years. However, there are no official statistics on Belarusians being forced into slavery overseas, therefore their number could amount to several dozen every year, writes Respublica. Human traffickers typically seize the documents of Belarusian men upon their arrival in Russia, put them in squalid living conditions in unknown locations, and force them to work 14-16 hours a day with little or no payment. They often subject slaves to torture and threats to prevent them from escaping, and some have been mutilated or killed while working. Meanwhile, neither Belarusian nor Russian laws provide the necessary normative-executive grounds to prevent and combat slavery. Belarus develops potential in space technology. The Belarusian chairman of the United Nations Office of Outer Space Affairs, Aliaksiej Bielacarkoŭski, argued in an interview with Respublica that Belarus has inherited priceless knowledge and experience in space technology from the Soviet Union. Many inventions and technologies developed by Belarusian scientists are actively used for building land registries and maps, systems of accurate localisation, geodesic systems, satellite-based navigation, geological explanations, and weather forecasting, among other technologies. Belarus closely cooperates with Russia in space technology; however, more ties and collaborative projects should be developed with other foreign institutions and states as well. The country has built a new satellite and plans to launched it very soon. It will also launch a nano-satellite created by the Belarusian State University by 2020.